Our American Memorial Day has passed. There are others who have died for freedom around the world. We must not forget these who were brave and gave so much. The people shown in the picture are still on the Most Wanted list in China for their participation in the Tiananmen Square demonstrations. Who is Xiong Yan? Xiong Yan was born in China and He received his B.A. in Political Science in 1986. He attended Beijing University Law School as a graduate student from 1986-1989. In 1989 he was one of the student leaders who initiated the 1989 Tiananmen Democratic Movement. In the Massacre of 1989, his name was on the list of the 21 Most Wanted Student Leaders by the Chinese Communist Government; he was arrested and held at the Qin Cheng Prison for 19 months. In 1992, Xiong immigrated to the Unites States as a political refugee. That year, Xiong Yan committed his life to Christ. He joined the U.S. Army in 1994, and after 19 months on Active duty, he transferred to Army Reserve. 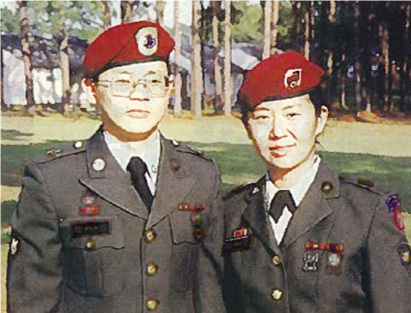 From 1995 to 1998, Xiong earned another B.A. degree in English Literature. In 1998, he began studying at the Covenant Theological Seminary in St. Louis, MO. He received his M.A. in 2001. The next year (2002), he received his M.A.R. from the Trinity Evangelical Divinity School. From there, he began studying Apologetics at Westminster Theological Seminary. Following 2002, he began studies at Gordon-Conwell Theological Seminary, with breaks for his years of military service, and received his Doctor of Ministry degree in May 2009. Xiong Yan was ordained with the Evangelical Church Alliance in December 2002. He became a U.S. Army Chaplain in 2003, and was then deployed to Iraq from 2004-2005. He served as Battalion Chaplain in 1st Calvary Division at Fort Hood, TX, then in as the Battalion Chaplain of the 2nd Infantry Division at Fort Lewis, WA, before spending one year deployed in South Korea. He is currently serving at the Warrant Officer Career College at Fort Rucker in Alabama. Capt. 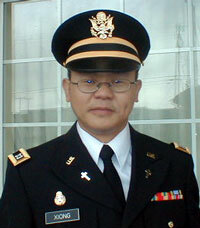 Xiong Yan continues to humbly serve the Lord as a Chaplain in U.S. Army. Remember the Tank Man activist? This entry was posted on June 4, 2010 by Boyer Writes. It was filed under History, Important to know, patriotic and was tagged with Boyer Writes, Christianity, History, patriotic, Tiananmen Square Movement in 1989.